Blandy Experimental Farm (Blandy) is a 700 acre University of Virginia biological field research station located in the northern Shenandoah Valley, associated with the Department of Environmental Sciences. The State Arboretum of Virginia, occupying the central 172 acres of Blandy Experimental Farm, is a system of gardens, tree collections, natural habitats, and open space dedicated to teaching the public about the natural environment. Blandy is a mid-Atlantic regional leader in environmental education, designated as a Center for Environmental Education Excellence by the Virginia Department of Conservation and Recreation. Our preK-12 programs draw inspiration from Blandy’s active science research program, align with Virginia’s Standards of Learning, and strive to immerse students and their teachers in authentic, field-based learning experiences. Our programs are dynamic and innovative; recent program additions focused on career awareness and the integration of science with mathematics, language arts, and social science/history. On an annual basis, approximately 7000 students engage in our preK-12 programs and 300 teachers participate in our professional development workshops. Our summer camps and youth and family programs serve approximately 100 youth each year. These youth programs encourage an understanding and appreciation of the natural world and environmental issues. The University of Virginia’s Blandy Experimental Farm and State Arboretum of Virginia seeks a full-time Environmental Educator to instruct outdoor education programs for preK-12 students (fall and spring) and to develop and present summer and winter programs designed for youth and family audiences. This position is split between our formal education programs (60%), under the direction of the Director of Education, and informal public programs (40%), under the direction of the Director of Public Programs. Our ideal candidate is a creative, innovative and dedicated environmental educator with experience in teaching and creating programs for preK-12 audiences and community youth and families. These materials must be uploaded and attached to your application in Jobs@UVa. Questions? Please call or email Candace Lutzow-Felling, Director of Education. 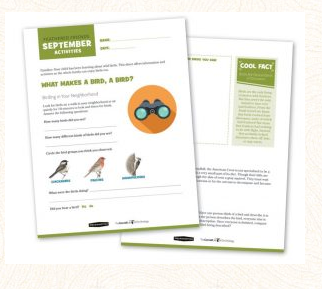 Perfect for elementary teachers, this free download is full of easy-to-use and fun activities that teach science content year-round with local birds. 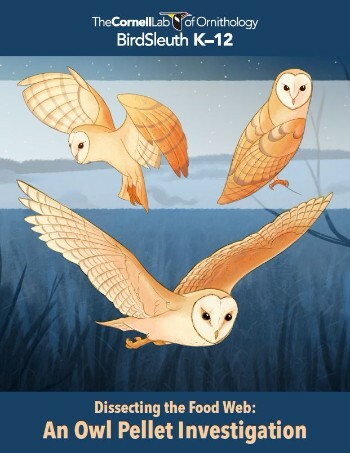 Explore habitats, migration, and citizen science with Feathered Friends. Download your copy to receive a free window bird feeder for a small shipping charge. Citizen science is a great tool to teach inquiry for any age group. 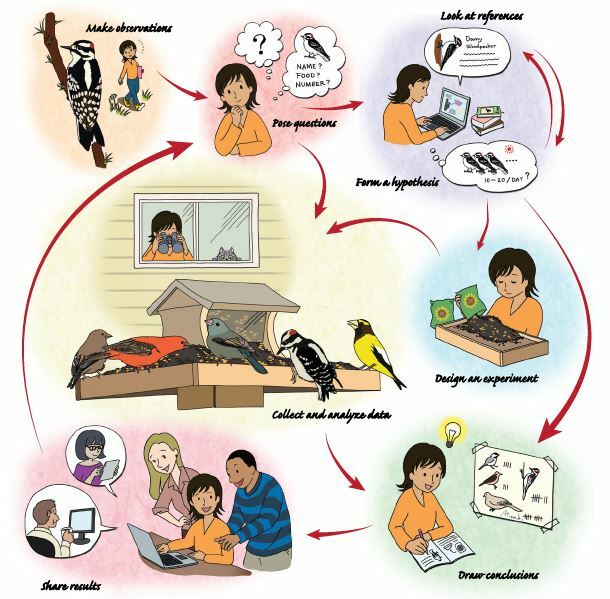 Investigating Evidence is one of BirdSleuth's most popular free resources and is aligned with the CCSS and NGSS Standards. From coming up with curious questions to drawing evidence-based conclusions, these lessons will help you guide your students through exciting scientific investigations. Plus when you download this curriculum, you get a free bag of bird seed. Who doesn't love dissecting owl pellets? Teach about ecosystem interactions and food webs with this new twist on a classic activity. This comprehensive kit has everything you need to make science learning fun and engaging. Looking for a chance to spread your wings this summer? 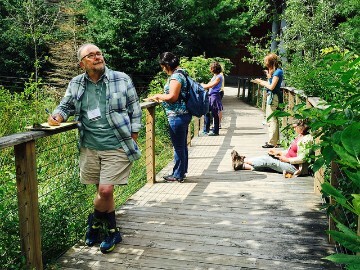 Join us in sunny Ithaca for an educator retreat focused on citizen science, inquiry, and birds. You'll hear from lab experts, try hands-on STEM activities, conduct your own investigations, and explore local birding hot spots. You may even make some new friends (both feathered and not). WHO CAN PARTICIPATE: The seminar application is open to any 5th-8th grade science teacher (public, public charter, private, and parochial), and who will be teaching a science course to students in the same age group in the 2018-2019 school year. Applications will be evaluated through a competitive process that will include information on teaching experience, a short written statement, and two letters of recommendation. Two spots will be reserved for qualifying Louisiana teachers. Teachers newer to the classroom are encouraged to apply. Applications will be accepted from January 8 – March 16, 2018. Collegiate School seeks an energetic and committed Middle School Science teacher to teach physical, life and earth sciences in an integrated curriculum. Included in this position is leadership in the development, communication, and implementation of STEAM practices across the Middle School curriculum. This is a fulltime, benefited faculty position. NSTA's Virtual Conference: Teaching Controversial Topics in Science. NSTA members pay only $53 for registration (if register before Feb 16); non-members pay a little more. All registered participants receive access to the archives to watch later, on-demand. Science teachers have an important role – to prepare students for the responsibilities of active citizenship. However, science educators often teach controversial topics but few feel well prepared. How can teachers approach the sometimes controversial science topics in their classrooms? Join us for a discussion on teaching controversial topics in science led by NSTA’s Executive Director, Dr. David Evans, and other invited presenters. The Science Directorate at NASA Langley Research Center in Hampton, VA is seeking in-service and pre-service teachers to come to NASA Langley during summer 2018 and work with our science education team to become GLOBE certified teachers. As a part of the professional learning experience, teachers will engage in GLOBE protocol data collection and analysis, learn about science connections to NASA, and participate in lectures from a diverse group of GLOBE Partners serving various communities and grade bands. The GLOBE Program (www.globe.gov) encourages an international community of teachers, students, scientists, and public citizens to collect and analyze environmental data. As a result of the experience, teachers will gain a better understanding of how GLOBE can be implemented across a variety of school and community settings. Interns will complete an individual GLOBE protocol focus with oral presentation and summary of work, followed by a culminating activity that involves support of a GLOBE Protocol training to further develop their role as a GLOBE Teacher. To be considered for the opportunity, participants need to complete the internship application which is posted through NASA’s Intern program: https://intern.nasa.gov/ossi/web/students/login/. Start by creating an account on OSSI by clicking "Register as a Student." All applicants, including in-service educators, will need to register as a "student". These positions are open to in-service and pre-service teachers. The 2018 Spellman High Voltage Electronics Clean Tech Competition is here! “Climate Change.” Two words that stir debate, but it’s something the world must address. Students who are currently in high school will be the generation who will confront a human-influenced climate change, the ones who will create the next great idea that helps mitigate how humans are helping to warm the planet and change the climate. So what can you do to help? The Spellman High Voltage Electronics Clean Tech Competition is an international research and design challenge for 15-18 year old pre-university students. This is an educational opportunity for students across the world that challenges students to be innovative while encouraging their passion for the sciences and we want all the eligible students that the Virginia Association of Science Teachers serves, to participate in this year’s competition! If you have already disseminated this information to your students and teachers, thank you, you can stop reading. If not, please read on. Registration is open and waiting for the students that President serves, but only until March 16th. In 2017, there were 26 nations involved. So far 17 different nations have signed up teams: the Bahamas, Bulgaria, Canada, China, Egypt, Fiji, France, India, Indonesia, Ireland, Jamaica, Moldova, Singapore, South Africa, Spain and the United States. High school students from Virginia are invited to take on the challenge and be a part of the Competition, I want to see your country represented! This is an incredible opportunity for the high school students in your country to show the world they’re capable of changing it for the better! I want this to be an opportunity for the high school students that Virginia Association of Science Teachers serves to show their knowledge and passion for STEM to the world as we try to solve the very real issue the world is facing: Climate Change. Now is the time to tell your teachers and spread the word to the students so they can gather their teams and get ready to register! They don’t have to submit their papers yet, but in order to be a part of the Competition, they must be registered before March 16. Late registrations will not be accepted. There is no limit to the number of teams per school/ organization either and I hope to see many registrations thanks to your efforts. I hope that in your position, you can help get this information to the students your organization serves. If you have any questions regarding the competition details, or how to incorporate the competition into your curriculum, please contact us. We look forward to having participants representing Virginia in the Clean Tech Competition this year and in years to come! Donna Sterling was a visionary science educator with a passion for working with science teachers and developing habits of inquiry-based teaching. Most recently, her leadership in the Virginia Initiative for Science Teaching and Achievement (VISTA) focused on elementary and secondary teacher professional development. This award recognizes that exemplary teachers engage in continuous improvement, and is designed to support a professional development plan for the improvement of science teaching. In 2018, the award will be given to an exemplary secondary teacher. The award alternates between elementary and middle/secondary. The awardee will receive a total of $4000. In addition, travel costs will be reimbursed to attend the 2018 VAST PDI to receive the award and to the 2019 VAST PDI to present a session on the professional development experience and outcomes. The awardee will receive $3000 at the VAST PDI in 2018. The remainder will be awarded after the awardee presents at the next VAST PDI and also submits an article to either the newsletter The Science Educator or the Journal of Virginia Science Education. 1. In your cover letter, include information on yourself, including your preferred name, your home and school addresses, and phone numbers and email address(es) where you can be reached. Tell us how many years you have taught, where, and what grade levels. 2. In no more than two pages, single-spaced, describe an inquiry-based science unit that you taught. Describe how your unit is student-centered and includes community engagement. Give evidence that the unit was effective. Evidence documents such as student work can be submitted separately, and will not count toward the two-page limit. 3. In no more than two pages, single-spaced, describe your plan for professional development, using the funds received through the Sterling award. These plans may include summer courses, attendance at workshops, study abroad opportunities, instructional materials development under the guidance of experts on-site, etc. Feel free to be creative in your plan. Submit the professional development description with anticipated outcomes, including plans for a presentation at the 2018 VAST PDI. Tell how this award will help you become a better teacher of science and will support the development of leadership skills. Tell about your plans for writing an article about your experiences. 4. Submit three letters of recommendation based on direct observations of teaching. One letter must be from the science supervisor or someone serving in that capacity, a second letter must be from the principal, assistant principal, or instructional leader, and a third letter must be from a fellow teacher or a parent. Letters should address the following: Why is this teacher a good candidate for this award? What qualities do they exhibit as teachers that make the recommender think they will use the funds from the award to improve their practice as teachers of science? All materials must be submitted by 5 pm on July 15, 2018.